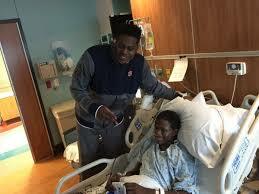 Auburn Offensive Lineman Shon Coleman is a remarkable athlete with an even more remarkable story. Coleman was diagnosed with leukemia in 2010, right before starting his freshman year at Auburn. It was a difficult battle. Coleman underwent more than two years of treatment at St. Jude Children’s Hospital in Memphis before being medically cleared. He made the most of his time off the field, employing a devoted work-ethic to his studies away from football. Coleman began the 2013 season as a backup tackle. He started 25 games over his last two seasons and was voted second team all-SEC selection in 2015. Coleman’s work ethic, which helped him both on and off the field, was instrumental in earning his Bachelor’s degree in 2014 and his Master’s in 2015. When Draft Day finally arrived for Coleman, he chose to spend it at St. Jude Children’s Hospital in Memphis. The place where he battled harder than anyone on the football field does. The place where he could show the world on the national stage how much it meant for his life and for the lives of many others fighting cancer and other afflictions. Regardless of what Coleman does in his NFL career, Browns fans can take pride in having not just a player, but a human being, who overcame adversity, kept the right attitude and worked hard to fight through it. He did the right things off the field, despite his circumstances, and sent a positive message to the millions of fans watching the Draft that they can get through what he has been through and can overcome any obstacles they face. Of course we hope he can become a big difference maker on the Browns O-Line, but he has already made a huge difference without taking a single snap in the NFL. Here is video of Coleman celebrating at his NFL Draft Party at St. Jude Children’s Hospital. Best of luck to you, Shon.